There is no other sport like Surfing. I will go to the grave defending the ever changing dynamic sport that is surfing and how it’s superior to all other sports. Now obviously that’s my opinion, but there is reason to back it up. Every surf session is different. In fact, every wave is different. You can never surf the same wave and never re-create the same session. There are elements that dictate how and when a wave breaks thousands of miles before they reach the shore. In all other board sports, including snowboarding, you can replicate a situation. The kickers stay in the same spot as the run before and they remain the same size, the rails and boxes and planters and stairs will all be there exactly as you left them the day before. Pretty much nothing remains the same in Surfing from session to session. Here in lies the problem when it comes to commercially advancing the sport. There will be a lot of people reading this that will say, surfing needs to stay core and blah blah blah. The fact remains it is already a commercial giant in terms of selling clothes and overall lifestyle and no matter how big it gets, the core reason as to why surfing is so amazing will never change as long as there are oceans and waves. In a recent ESPN article, Kelly Slater listed somethings he would like to see changed as to the way the ASP runs and operates. I very much agree with the majority of his points and I would like to address a few and see what your thoughts are. the other boardsports and major sporting events. Enter the Wave Pool: The reason the ASP doesn’t charge is because the beach is free and I don’t think that should ever change. However, the possibility of adding a wave pool into the schedule of the ASP might be the solution to generating cash to start a marketing division that solely works on promoting events and athletes without corporate brand agendas. 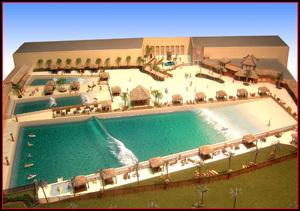 A wave pool would provide a setting that would make the sport of Surfing more exciting and real to the everyday person. Think how many people go to the X-Games or Dew Tour that don’t skate or ride MX? They go for the entertainment. Everyone thinks surfing is amazing, everyone wishes they could do it, and everyone enjoys watching people on waves, but not everyone can get to the beach. You bring a wave pool into the mix and all of the sudden you have a format with bleachers, and sky boxes, and concessions and an event that thousands of people can watch live and millions can watch on TV. The controlled wave environment would allow for superior TV viewing as you would not be subject to weather or swells. Now, don’t get me wrong, as I stated above there is nothing that can change the dynamics of surfing and that is why it’s such a powerful experience for those that participate in it. But would adding 3-4 wave pools into the circuit dilute that element? I would say the positive visibility that would come from it would out way the negatives. You would have a more controlled wave environment that would allow riders to go bigger, ride more waves and truly compete on a skill level as opposed to a “time the sets, take advantage of wave priority” method. Veterans often have advantage in ASP as they now how to use the current format to their advantage. And I am not saying to take that away, but every other board sport has a course that doesn’t change that allows the competition to be based solely on who does better, cleaner more technical tricks with the same opportunity given. Could you imagine watching Bruce Irons, Jamie O’brien or Dane Reynolds in a wave pool with perfect vertical lips, they would be soaring 10 ft in front of you. Riders could take more risks and perform far more technical tricks and that makes for better and more exciting competition. Look back on when the rumors that Tony Hawk was going to pull the first competition 900 at the X-Games, or when Shaun White was going to do a 1260 on the Half Pipe. Or When Travis Pastrana was going to pull a double back flip. There is drama and marketability and something that interests the average non-enthusiast viewer. People that don’t own motorcycles were emailing their friends Travis’s double backflip the next morning at work. We don’t have that yet in competitive surfing. 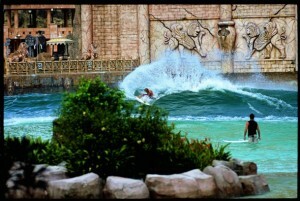 Wave pool stops should also be in land locked states or big coastal spots with no waves, the ASP could have stops in Vegas, Utah, New York, Texas, Chicago. Once the technology and end product can produce a world class break, surfing will become one of the most widely adapted and participated sports in the world. If you could truly progress your surfing in a wave pool in Vegas and then go to the coast and shred, you will have kids entering the ‘CT from places you could never imagine. Flash backs of Rick Kane from North Shore come to mind. You will see people driving with boards strapped to their roof in land locked states. You will have pro shops and local contests selling out tickets, kids going to school with sponsorship deals. Surfing will reach mainstream media as a sport, which will mean better and bigger events both in and out of the beach, better purses and better paid athletes. The entire sport will change in terms of visibility and exposure. Whether that is good or bad? Time will tell. For the sport itself I think it will be good, for the core surfers that don’t care about world titles or ‘CT standings it will be annoying as you might be getting dropped in on by a kid from Kentucky with a bad farmer tan. 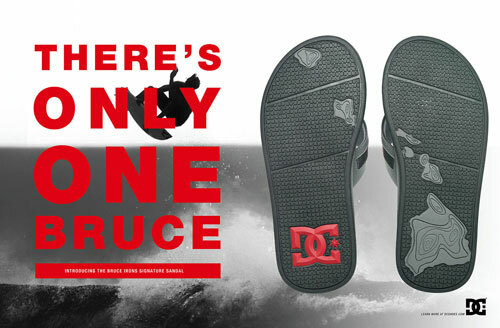 DC Shoes announced last week that they’re releasing the Bruce Irons signature slippas. Check out that link too, because there’s also a new video commercial for the Bruce that’s pretty cool. For Spring 2009 DC is proud to unveil Bruce Irons’ signature sandal, the first pro model offered to a member of the small, elite DC surf team. An all-new sandal, it’s been built from the ground up specifically for Bruce, the longest standing member of the DC surf team (on for 10 years). It’s good to be Bruce Irons. Things couldn’t be going any better for his career since announcing he’s retiring from the world tour. 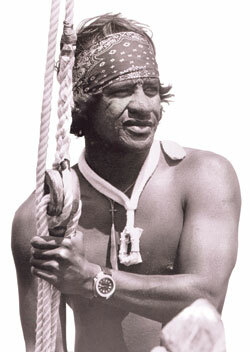 Shortly after he won his first ever WCT event in Indo. We also got news that Volcom is shooting a Bruce video this year with producer Bill Ballard (Archy). And now a signature sandal. Not bad. If only retiring was this good on us all. Although the 2008 Pipeline Masters ended up looking like a Backdoor Shootout with all of the rights that were taken, the official Backdoor Shootout is just a couple of days away from unleashing it’s magic on the world of surfing. The holding period for the 2009 Da Hui Backdoor Shootout opens this Monday and will run through Jan. 15. The opening ceremony for the seventh annual Shootout will be held Sunday morning at Ehukai Beach Park for anyone one interested in attending. The Backdoor Shootout is doing a solid job at setting itself up as one of the premier independent surf competitions in the world. Any competition at Backdoor Pipeline is obviously going to generate all kinds of hype and excitement. Mixing in a world class line-up of surfers such as 2008 winner Jaime O’Brien, Makua Rothman, Mark Healey, Danny Fuller, Bruce Irons and many more only adds to that. On top of it all, Da Hui offers up a very healthy prize purse, as Jamie O’Brien took home $50,000 for his efforts last year. Bruce Irons, the ‘08 Shootout runner-up, pulled in $25,000 for his efforts. That 2nd place total stands just a few G’s short of the typical amount seen by winners of ASP World Tour events. Unfortunately, it doesn’t look like the event will be webcast, which is kind of a downer. There was a staggering amount of web traffic for the Pipe Masters and I’m sure many of those same fans would love to get another Pipeline fix. Hopefully this is something we can look forward to for future Backdoor Shootouts. For those who live on the islands and those visiting over the next 10 or so days, catching a glimpse of this classic event is something that will definitely be worth your time, so be sure to check it out. With the Pipeline Masters coming to a close last Friday, the dust has now settled and next year’s ASP World Tour picture is becoming clear. The departure of Andy and Bruce Irons from the 2009 door has opened the door for Marlon Lipke to become the first ever German on tour. Speaking of Andy and Bruce, with both of them failing to end up in the Top 10 on the final ratings, this is now the first time in it’s 32 year history that no surfers from Hawaii ended ranked above the 10 spot. Freddy Patacchia was the highest ranked at #12. Hopes of bringing the title back to the islands will now be resting on his shoulders as he is the only Hawaiian returning from 2008. Kekoa Bacalso and Dustin Barca round out the rest of the small Hawaii contingent for 2009. The three 2009 tour wildcards went to injury applicants, Dean Morrison (AUS), Aritz Aranburu (EUK), and ASP WQS No. 16 Marlon Lipke (GER). Lipke will be the first German ever on the Dream Tour. As expected, the rain and Kona winds have kept the 2008 Billabong Pipeline Masters from running it’s final day of action today. Conditions at Pipe are a sloppy, wind-blown 2-3 ft; nothing even close to being worthy of crowning a champion for the prestigious event. With only one full day needed to crown a champion, Randy Rarrick is hoping for a classic Pipeline finish. The swell forecast is showing a possible swell for Friday and another for early next week. Stay tuned to 5ones updates, and check out the vids below for some of the top 2008 Pipeline Masters footage so far. There are few young surfers in the world who get me amped about what’s possible in surfing and the direction our sport is headed the way Dane Reynolds does (Clay Marzo and Dusty Payne being a couple of the others). When Dane went down with an ankle injury following the Billabong Pro Mundaka, he left a noticeable void on the Dream Tour. With Kelly wrapping up the world championship so early and Bruce and Andy Irons going on sabbatical, Dane was one of the few guys left that really made the tour exciting to watch. Just like Slater, you really have no idea what you’re going to see on every wave he takes off on. Dane is single-handedly progressing the sport the way few others have. Dane is working on making his way back from the brutality he imposed on his ankle. For the first time since injuring himself in Spain, Dane has opened up on his blog about the injury and where he’s at in the recovery process. Check the video, the very wave he injured himself on is a testament to how talented Dane Reynolds is. The prestigious Sunset Beach has a way of separating the men from the boys. And that’s exactly what the famous North Shore right-hander is doing for the early rounds of the 2008 O’Neill World Cup of Surfing. The scene at Sunset today was heavy. 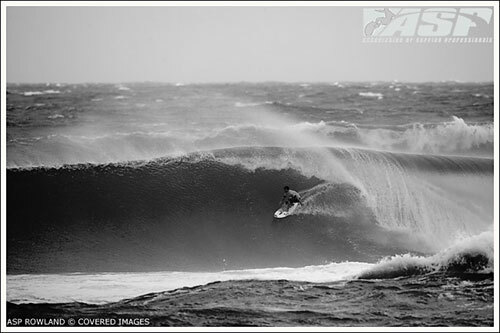 A building swell was adding to the already 7-10 ft. waves that were rolling through the wind and the rain. It was the type of Sunset that leaves many of the contestants wondering why in the hell they even signed up for this event in the first place. And that’s just how the Occy’s, Bruce’s, Sunny’s, and Kamalei Alexander’s of the world like it. Those four, along with a couple of young hawaiian upstarts in the form of Dusty Payne and Torry Meister, stood out from the rest today as the second leg of the Vans Triple Crown got moving. The first two rounds of the event are now in the books and Rd. 3 will likely get the call tomorrow morning. Forecasters expect the swell to continue building throughout the night. If the weather clears up, we could be looking at an epic Sunset tomorrow. With some juicy heats on tap and everyone scratching for points in the final WQS 6-star event of the year, here is to hoping Mother Nature cooperates.